Why buy a souvenir when a tailor-made one is possible? This one is suitable for table display or hanging on a wall. Remember your month at Summer Camp with a great log wall hanging. You can use macaroni noodles to form the letters on the log. After Shellacking the noodles...they look amazing.This craft requires parental assitance and supervision. (Parental Assistance and Supervision Required) Saw a log section 1/4 inch thick from a cedar or pine log 2 1/2 inches in diameter. Drill a hole near the edge. Use a sandblock and garnet paper to smooth one surface, or, if ambitious, do both sides. Sand well enough so that the annual rings show, which will make the finished souvenir that much more attractive. 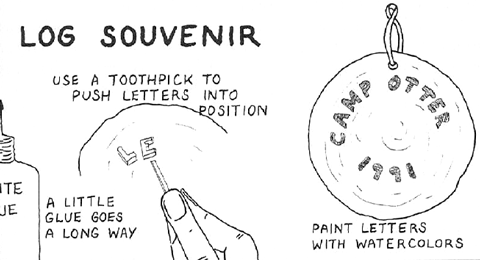 Spell the camp name, date, cabin number, child's name, or whatever legend is desired. Since the even appearance of the letters is important, have the children use a toothpick to push letters in place. Wait a few minutes for the glue to set, and paint tops of letters with watercolor. When dry, attach a string and dip in shellac to preserve colors. With younger children, or with large groups, mass-produce the log sections with a power saw, and stow in a box for children to rummage through.